2. 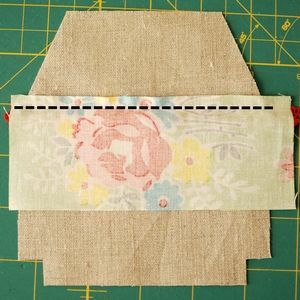 Place the roof fabric on top of the trim, right sides together, with the edge of the fabric 1/4” above the stitch line. 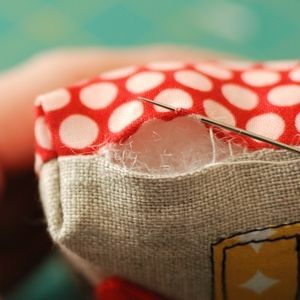 Sew a 1/4” seam along the stitch line. 3. Fold the roof fabric up. If you use rick rack, go ahead and iron the fabric. If you are using pom pom trim or other synthetic trim DO NOT PRESS WITH IRON!!! Pom pom trim melts very easily. Finger press the fabric only. 4. Turn the house over, and trim the roof fabric to match the outline of the house. 5. Turn the house back over and machine baste the roof fabric in place, very close to the edge of the house. 1. Cut a piece of Wonder Under slightly larger than the appliqué piece. 2. Adhere the Wonder Under to the wrong side of the appliqué fabric with an iron (bumpy side of Wonder Under to wrong side of fabric). Let cool. 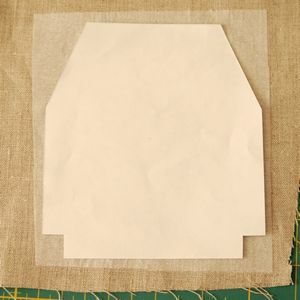 Lift up an edge of the paper backing to loosen it from fabric. 3. Cut out the piece of fabric that is fused to the Wonder Under. 4. 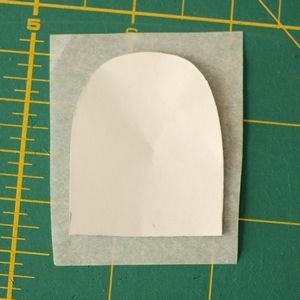 Remove the paper backing from the fabric. 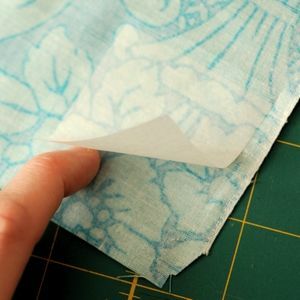 Place the pattern piece on the sticky side of the fabric and cut around it. 5. 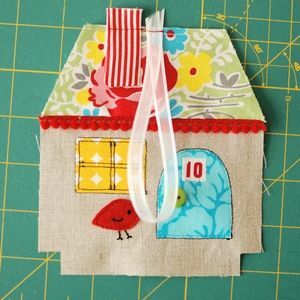 Remove the pattern and iron the appliqué in place on the front of the house. 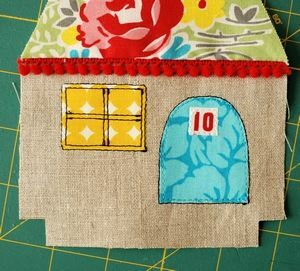 Do this for the window, door, and house number, using the pattern as a guide for placement. DO NOT decorate your house below the line marked on the pattern, and remember to keep the iron away from any heat-sensitive trims! 5. 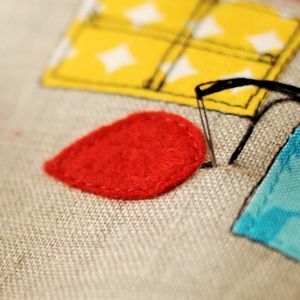 Using a straight stitch on your machine, sew around the outside edge of the appliqué, just off the fabric edge. 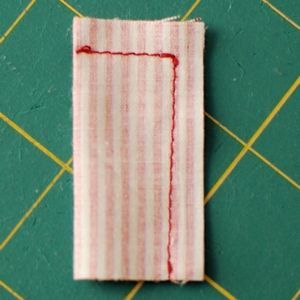 Sew a second line just on the inside of the fabric edge. For the door, I used thread that matched the door on the inside of the fabric, black on the outside. For the window, I used black thread only. I sewed pretty fast, not aiming for a super straight line, I like the hand drawn look of wobbly lines. For the house number, I only sewed one seam, on the inside of the fabric edge. 1. Cut a bird from felt and place it on the house. Sew in place by machine with matching thread, just on the inside edge of the felt. 2. 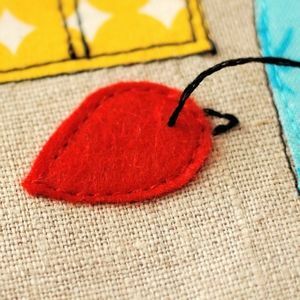 Divide the embroidery floss and use three strands for the bird. Hand embroider beak, feet, and wing with backstitches. 3. 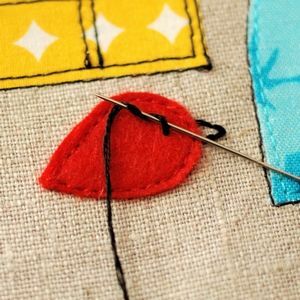 Make a French knot eye. 1. 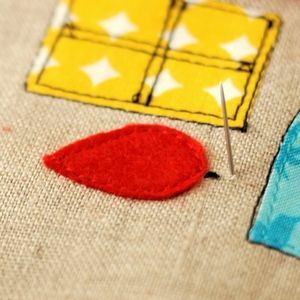 Add the button last so you don't have to worry about bumping into it while sewing the birdie or other appliqués. 1. Fold chimney fabric in half. 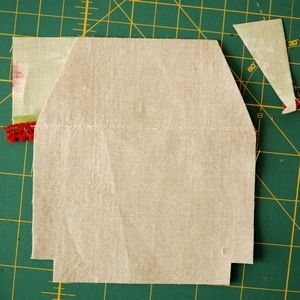 Sew across the top and down the side with the raw edges. 2. Trim corner and seam allowances. 4. Place chimney upside down where indicated on the pattern, right sides together. Sew in place very close to the edge of the fabric. Fold ribbon hanger in half, place on the top and center of the roof and sew in place very close to the edge. 5. Alternate method: you may press under the top and side edges of the chimney fabric 1/4", right sides facing out, and hand sew the chimney closed with a ladder/blind stitch before attaching to house. 1. Place the front and back of your house right sides together and pin. 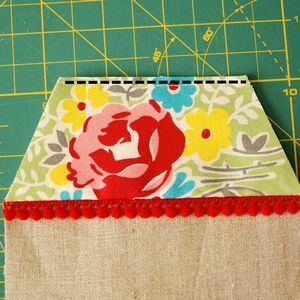 Make sure your ribbon will not get sewn into the seams. 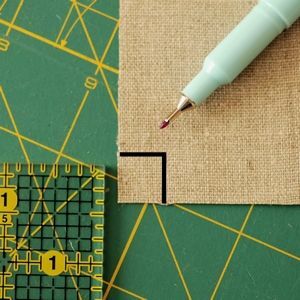 Sew around the bottom, sides and top of the house, leaving a 1-1/2” turning hole on one side. 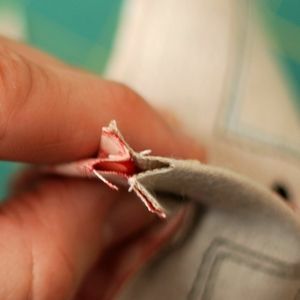 DO NOT sew the notched cutouts yet. 2. Reach inside the house to pull open the cutout on one side. Flatten it so the seams match up, and the seam allowances go in opposite directions. 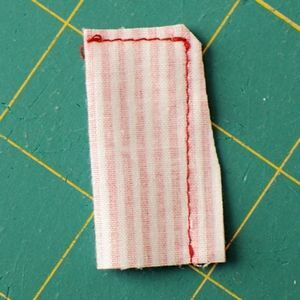 Sew across this short straight edge with a 1/4” seam allowance. Repeat for other side. 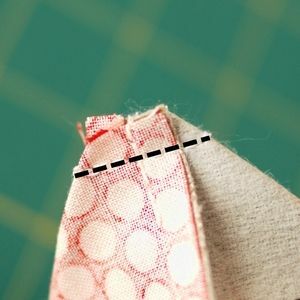 Make sure the seam allowance on the bottom of the house is folded the same direction on both sides. 3. 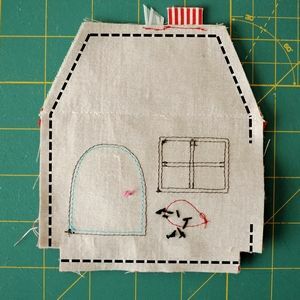 Turn the house right side out, stuff, and close the turning hole with a ladder stitch. 4. You're finished! Hang your ornament on a tree, doorknob, wall or stocking hook. P.S. The number fabric is Annie's Farm Stand Seed Catalog from Lakehouse. It has lots of different numbers in several fonts and sizes, perfect if you're going to make a bunch of these. P.P.S. 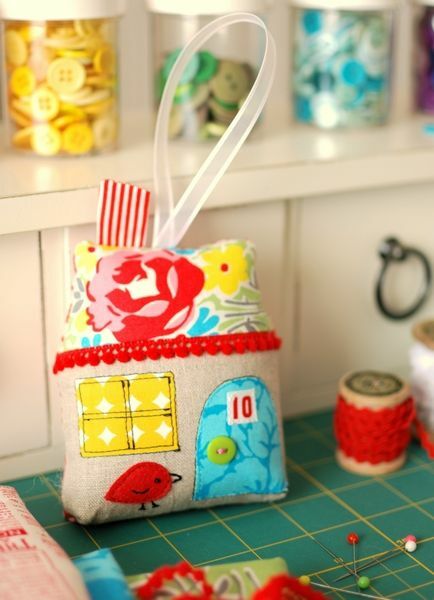 For those of you who don't sew, I will be adding the house ornaments to my shop soon! All the ornaments are on their way to new homes, thanks so much! P.P.P.S. Don't forget that I am having a sale this week, just enter the code CELEBRATE during checkout at my Etsy shop for 20% off your order. The patterns in my sidebar are already discounted. The sale goes through Wednesday, 10/26. Sale has ended, thanks! Wow, I cannot even begin to tell you how adorable these little ornaments are! 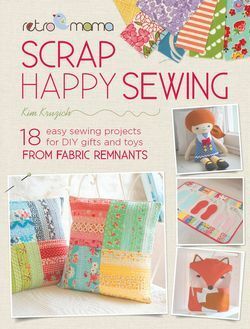 these are so sweet kim, so perfect for using scraps that you just can't part with! Wauw!! Thank you SO much, I love it. Well, this is about the cutest thing ever. I'm definitely going to give this a try! Really cute! Thanks for the tutorial. found you on Pinterest. Thanks, everyone! Oh, don't you just love love love Pinterest? Ohhhhhhhhhhh I love this houses thanks for sharing!! Love, love love this. Can't wait to try it. 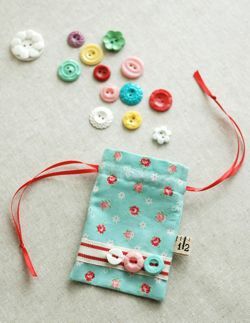 Great tutorial -already on my pinterest board! Oooh!!! SO cute! 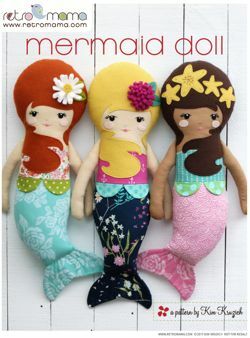 And I definitely making one (at least) of these! These are soooo stinkin' cute! Dang. Something else I have to make! Thanks a bunch for sharing! thank you a squillion times over. i love this project! Thanks for the wonderful tute! You so rock... Those houses are darling! side note...i am in Fort Wayne...Id love it if we were neighbors!? This is the first time I've liked a handmade holiday ornament. Lovey-love-love! I'll add this on my list of to-dos! Thanks for the great tute! Gorgeous! Now to see if a non sewer like me can recreate the same gorgeousness? These are so cute! What a pile of work you put into the tutorial! thanks for the great tutorial for the cute little houses!! They are adoreable!! I love these little houses. I love this little houses. Thanks for the tutorial. 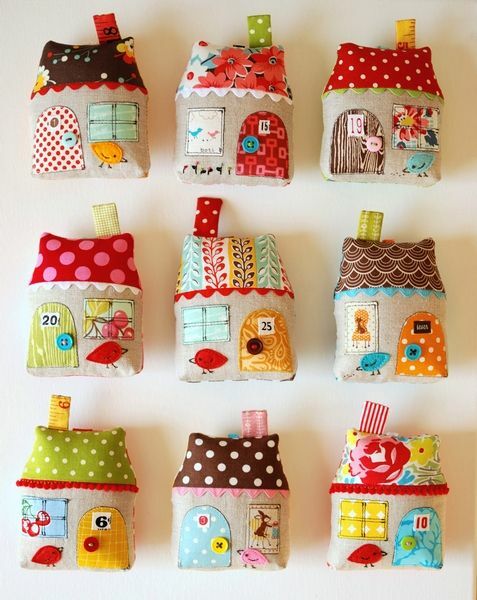 I am new to sewing, so i hope that this isn't over my head...but i am so in love with these little houses! Thanks a lot one more time ! J'en ai fait une hier, j'adore !! these are fantastic! thanks for sharing a tutorial. So cute. I love love love your style! 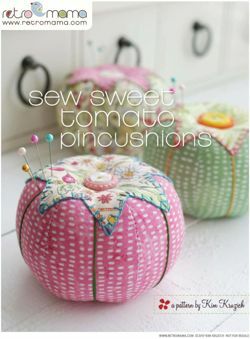 SEW beautiful! Thanks for sharing! Thanks for the tutorial. This is soo great, I'll try it! I just can't stand it!!! Really, I LOVE it soooo much!!! I LOVE houses, I LOVE birdies, and your ornaments drive me crazy with all their adorableness!!! Thank you so so so very much for sharing this fantastic tutorial! Wow I have just popped over from Craft Gossip. Thank you so much for this lovely tutorial. I have now become a follower of your blog, it is so pretty and inspirational. Love, love, LOVE! I've just discovered your blog through craftgossip. Looking forward to having a look around. 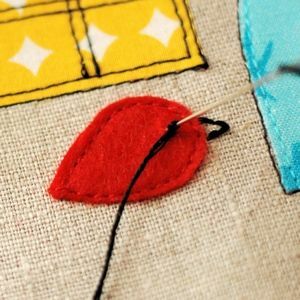 I'm a pretty inexperienced appliquer, so please forgive me if this seems silly, but I have one question...why do you put iron-on on the whole house back? Is it just to stiffen the fabric? Hi Michelle, thanks for your question! 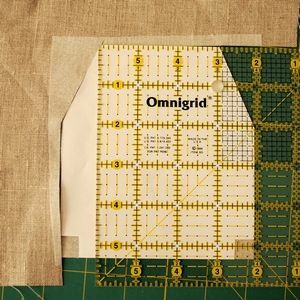 The interfacing does a couple of things: it adds some stability to the fabric for the embroidery and applique, and because linen tends to be a bit “wobbly” (it shifts and warps when you cut and sew with it), I find it easier to work with when it has interfacing on the back. 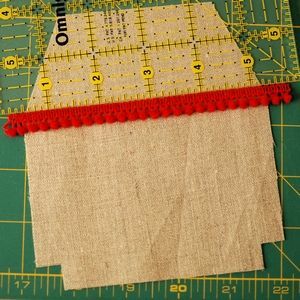 Also, because linens have a looser weave, the interfacing adds some structure and helps keep the linen from getting too lumpy and losing its shape when you stuff the house. Hope that helps! Love this! I made one and linked up. Thanks for a fabulous tutorial!! This is adorable and your instructions are excellent! Thank you. 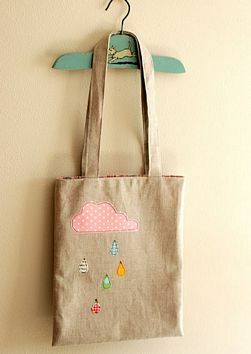 I've just finished making one and love it although it's not nearly as cute as yours ... I'm hoping practice will make perfect. These are super cute! I'm thinking that if you enlarge the pattern you can make a lovely pillow! Awesome. We posted this on our face book. Hopefully you will get some great feedback. I cant wait to make some. thank you for sharing. Thanks so much, Katie and Calico house! Very cute, nice tutorial! Thanks for sharing! WOW! love your little houses and thanks so much for sharing the tutorial. your fabrics are great and really make the house. LOVE! Thank you for this great tutorial! Thank you for the great tutorial! 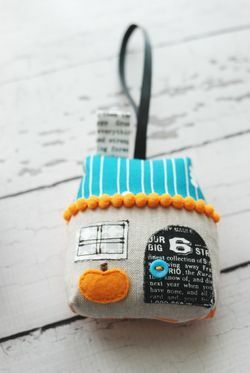 The houses are just adorable and i will be making a mini version as a key ring for Christmas for my mum! So, so gorgeous. I love everything about these little houses. Thank you for a great tutorial... I think I will be making some of these tonight. This is a delight to make and the tutorial is so clear to follow. Thanks so much. Do you have any more of these??? I wish I had seen these sooner? Our home went into foreclosure this year and somehow God saved it for us and I would love to gift each of my children one of these as a reminder of God's promises, but at 9 months pregnant I do not think I would have the motivation :( please e-mail me at wilkinson6282@roadrunner.com if you have any! You should really sell these...I checked your etsy shop but saw nothing there. I would buy 9 just as you have in the picture, They are gorgeous!!! Okay, I am DYING over these! Look how cute they are! ^_^ Love. I absolutely love these! And so well explained, thank you for sharing! 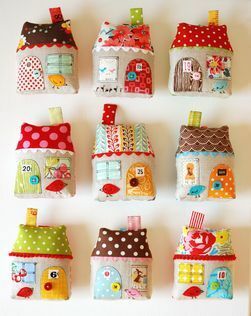 I just found your adorable little houses on the OnePrettyThing Blog http://www.oneprettything.com/ They're just so, so sweet! These are adorable! I love the wood grain fabric door and all the little birds! Absolutely love these! After making a teensy house (to use as a lavender sachet) on my own, struggling all the way and gnashing my teeth when the bottom of the door turned under, I've now printed your pattern and instructions and am going to give it another go. Truly amazing! Thank you for tutorial! 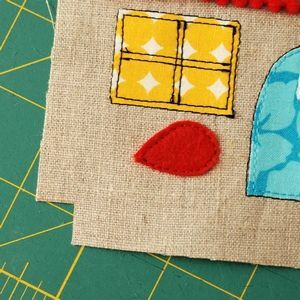 What a great tutorial and an adorable house. I love it! Thank you! Wonderful tutorial! Thanks so much for sharing. I "pinned" this so I can trythem myself. домики чудесные! спасибо за МК! meu Deus cada coisa espetacular q trabalho maravilhoso!!!!!!!!!!! A casinha é linda, a coruja é a cara da minha irmã, encantadora ...to apaixonada. Thank you very much! great idea and great design!! Thanks for tutorial! These are so cut! These are so adorable! I already made three during the last two days. I think they are perfect for spring! Thank you so much for sharing this tutorial!! I love so much your job, is excellent!!! Thank you for share...I made one and I'm in love. I put a link back to your blog, hope you don't mind. Merci beaucoup pour ce gentil tuto que j'ai fait avec grand plaisir. Je vous mets sur mon blog en France. wow these are really lovely! This so called brand sells plush homes exactly the same designs as you did here. I believe a design showed/shared should only be used as a reference. And selling it & making profit from it? Unacceptable for me. I have a big passion for little houses and those are really adorable!! !Thank you so much for sharing this amazing tutorial. 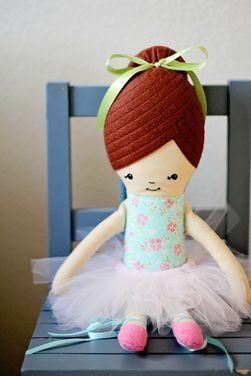 I love your blog, your Greta doll are so sweet. I'm your new follower. Your little houses are adorable! F.
Great work and thanks for the tut! So cuuuute! I'll link to my blog, if you don't mind. I will specify is yours not mine!!!!! Thanks for sharing! Ohhhhh, Thank you so much, I do! Thankyou for taking the time to publish this tutorial. I really appreciate you doing this. I have just cut out some scraps ready to go. And thankyou too for answering me when I emailed you because I couldn't find the pattern on your site. I wish you peace and happiness. You have spread some joy, thankyou again. 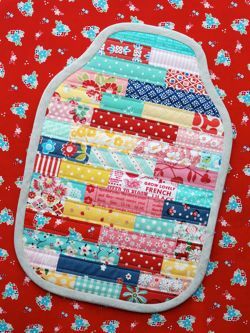 Just found your blog a week ago, what a treat, love all the colours and inspiration... Im not good at sewing (painting is my thing) but I so have to give this a try and maybe even make a pillow for my daughter. Could also be something we could do together. Love making these but not easy to turn. Any suggestions? Is it possible to make the turning hole any larger? Perhaps take out a few stitches and see if that helps! These houses are so adorable! I have made a hair clip organizer inspired on them. I have linked you in my post! Thank you so much for sharing this great tutorial!! Gemma, your hair clip organizer is gorgeous! I've linked to it on my FB page :) Thank you!! I've been admiring your little houses... Thank you so much for the tutorial! Adorable is the only word for these ornaments! I think this would be the perfect gift for adult kids spending Christmas away from home! 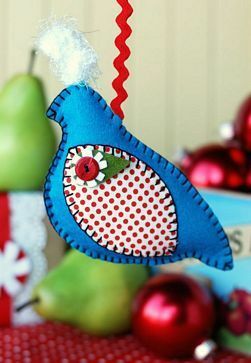 I just wanted to let you know I"m featureing this post on my frugal sewing site Sewistry next week-- Here's the link: http://sewistry.com/2013/11/free-sewing-pattern-home-holidays-christmas-ornament/ Thanks! can these be sold on a small scale w/mention of your tutorial? thanks! i love them-they make great gifts! ADORABLE! Thank you for the pattern and tutorial! 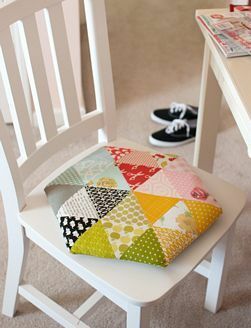 I'm new to your blog...found you via She Can Sew! LOVE LOVE LOVE these little houses...they are so adorable! These are beyond adorable! LOVE! i just made a small batch of these little houses using your tutorial and they came out great. 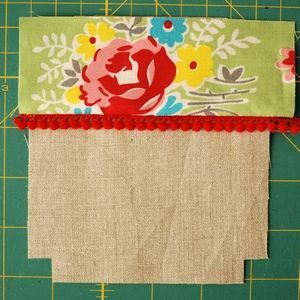 i love using scraps and this was perfect for that. seeing the combos come together was exciting. 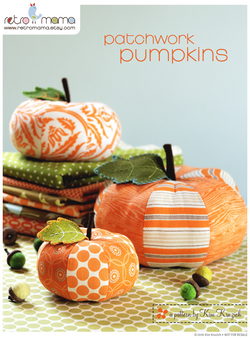 I see that you are ok with selling a product from one of your patterns, does this include your free tutorials? I would certainly credit you as the pattern maker. Those are really cute! Shared your link on my face book page. These would make adorable pin cushions also I think. Son hermosas. Gracias por compartir tu trabajo. They are beautiful, thanks for sharing your work. I just discovered these sweet and adorable little houses and can't wait to make some. They will add some Spring punch with all their delightful colors this wintery season! God bless and thank you. Thanks for this great tutorial ! These houses are lovely! Thank you so much for sharing!!! 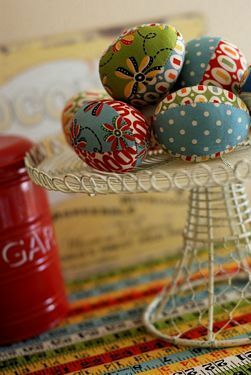 I didn`t know what to do to help the Church`s Bazar and now I so happy looking for my fabrics!!! Thanks so much for the tutorial. I love it! Holidays. Well, yes, I could make these for next Christmas, but it is only April, so I'm not ready to think in that direction yet. 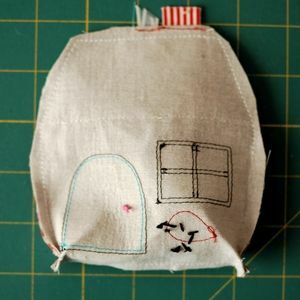 I LOVE these tiny houses, and I think they'd make an adorable little coin purse that I can attach to a key leash inside my next lunch bag! It could stash the coins of the realm for the soda machine or my next fat quarter bundle! I could have another in my purse for the parking meter! I have many scraps and many days ahead to think of gifts, and all I'm going to want to do is make more, more and even more of these, and I'm already thinking of changes, such as one shaped like a tent for my camp-happy grandson! Thanks for the new obsession, LOL! I love this! oh this is so great and generous! i can't wait to make one for my family!!!! i will share it on the flickr group when i make one, i'm planning this would make a good Christmas decor! I will add some haberdashery too. thank you for sharing! Beautiful and amazing, I loved your little homes. Thanks for sharing this interesting tutorial with us. I will definitely try to make this at home. Thank you so much for the amazing informative, picture-laden tutorial and cute project! I still have the one I won from you a few years ago and I love it! These little house ornaments are adorable. Can't wait to make some. One suggestion, though for the website, the gray shade for the text on the sight is very difficult to read, especially for these 64 year old eyes. Yes, I did just get new glasses! Hi! 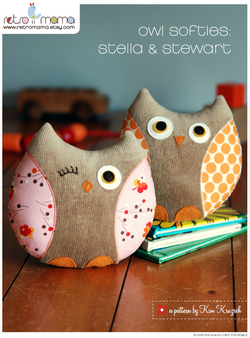 My name is Kim Kruzich and I'm a sewing pattern designer, author, and mom to two sweet boys. On my blog you'll find lots of sewing inspiration, free patterns and tutorials, and updates for my shop and work.